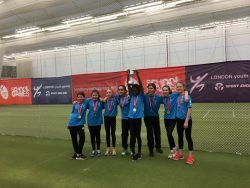 The Wandsworth Girls Cricket team took part in the London Youth Games Cricket finals at Lords Cricket Ground and took Wandsworth to the top of the table for the London Youth Games. With 180 points Wandsworth has taken the lead by seven points. Having been drawn against Ealing in the Quarter finals, Wandsworth knew they had a difficult task ahead of them, having already been beaten by Ealing in the previous group match. The girls were confident going into the match ready to redeem themselves. The Wandsworth girls batted first and started out very strong, posting a total of 140. In reply, the Wandsworth bowling restricted the batting of Ealing, meaning they never troubled the Wandsworth total, scoring 58 in total. In the semi final, Wandsworth were up against a Bromley side that had won their previous match by over 100 runs. However, nothing could get in the way of the Wandsworth Girls confidence now. As with their match against Ealing, the Wandsworth girls batted superbly hitting a grand total of 126. In reply, Bromley started strongly, but some well taken wickets put a halt to their chase, eventually scoring 55 runs. Stepping into the final, the girls were up against last year’s winners, Hammersmith & Fulham. The girls were looking a bit nervous in the warm up, but as with previous matches, managed to score a truly fantastic batting total of 143. In a carbon copy of the other matches, the Wandsworth bowlers did an amazing job of nullifying the threat of the Hammersmith & Fulham batters, only letting 91 runs slip. Wandsworth were crowned champions of London in a fantastic day! Medals were presented by Former England International Cricket Captain, Mike Gatting. 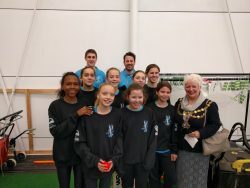 Also in attendance was Wandsworth Deputy Mayor, Councillor Wendy Speck – who spoke to the girls before their match and wished them well. “I really enjoyed my day watching the girls cricket team played at the London Youth Games. I was impressed with their team work and their skills.